Aromatherapy, the use of essential oils to promote well-being and ease discomfort, has been used for centuries and has a growing base of research and support in modern health care. 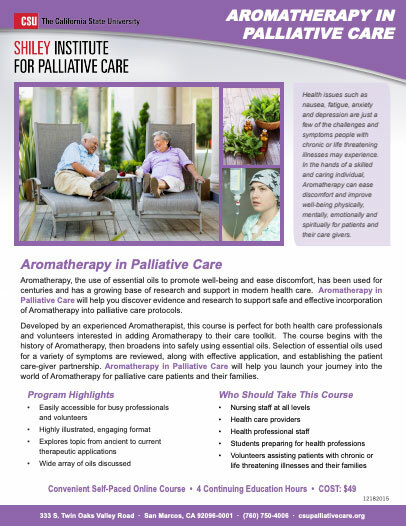 This course will help you launch your journey into the world of Aromatherapy for palliative care patients and their families. More and more health care providers, and their patients, are recognizing the value of aromatherapy, as well as other complementary therapies as an adjunct to allopathic medicine to treat serious medical conditions. Aromatherapy and the array of benefits it provides to patients, especially those in palliative care, is being recognized and is rapidly growing in use. Health issues such as nausea, fatigue, anxiety and depression are just a few of the challenges and symptoms people with chronic or life threatening illnesses may experience. In the hands of a skilled and caring individual, Aromatherapy can ease discomfort and improve well-being physically, mentally, emotionally and spiritually for patients and their care givers. Developed by an experienced aromatherapist, this course is perfect for both health care professionals and volunteers interested in adding aromatherapy to their care toolkit. Data on the history of aromatherapy broadens into the safe and effective uses of essential oils, including the importance “intent” plays in Aromatherapy. 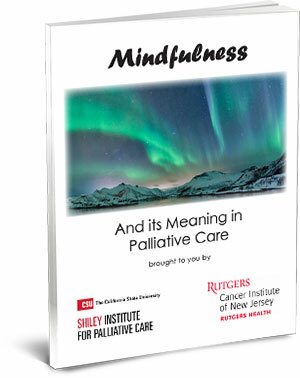 Students will discover safe and effective ways essential oils can be incorporated into palliative care protocols backed by evidence-based and scientific research. This four hour, self-paced course will give students the necessary information about commonly used and available oils. The course will provide a variety of resources and instructions on the safe and effective use of essential oils, discussion on application methods, and selection of essential oils used for a variety of symptoms and concerns for patients. Is taught by: Cindy Corwin, Certified in Clinical Aromatherapy, and CEO of Healing Essentials, LLC. Identify other potential uses of essential oils such as, creating essential oil blends, hydrosols, and more. Is this a webinar or is it interactive? Is there a course syllabus? Yes, it is provided to enrolled students. Course content description is found on this web page. CMEs are not being offered at this time but Continuing Education Hours are being offered.